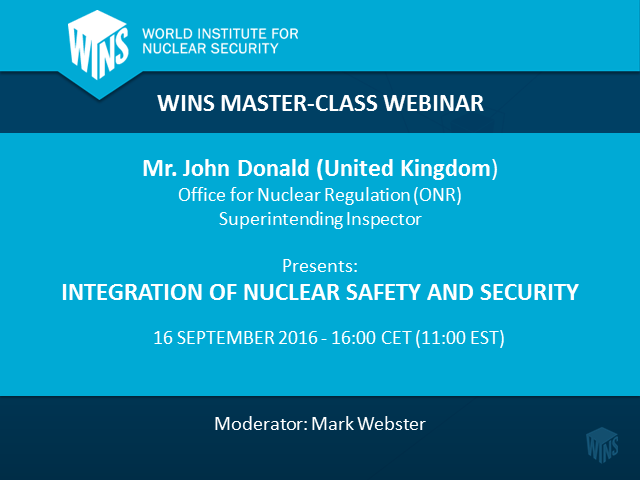 By exploring the areas of intersection between nuclear safety and nuclear security, the objective of this webinar is to identify how more effective protection of people and the environment can be achieved when nuclear safety and nuclear security are integrated a strategic, operational, and cultural level. En cooperación con la Secretaría de Energía de México (SENER), el World Institute for Nuclear Security (WINS) organizó un Taller Nacional sobre la Seguridad física en el transporte de fuentes radiactivas en la Ciudad de México, entre el 28 y el 30 de noviembre de 2017. El propósito de este webinario es informar acerca de los principales debates y las conclusiones clave de este taller. También será una oportunidad para hablar acerca del régimen internacional de seguridad física para los materiales radiactivos durante el transporte, analizar un ejemplo de marco regulador y examinar la aplicación de medidas de seguridad física durante el transporte desde la perspectiva de un transportista. Countries are increasingly facing individuals “inspired” to commit violent acts against their fellow countrymen and governments. These individuals are often referred to as Homegrown Violent Extremists (HVEs). The term HVE includes any citizen who advocates, is engaged in, or is preparing to engage in ideologically-motivated terrorist activities to further political or social objectives. The objective of this webinar is to identify the current and future threat of radicalised individuals and how this might impact the nuclear industry. The objective of this webinar is to take lessons learned from our WINS workshop on Countering Homegrown Violent Extremism in the Nuclear Sector and identify measures for mitigating the threat posed by radicalised individuals through behavioural observation. A real-life case scenario will be presented and lessons learned will be applied to the nuclear industry. Join us on September 13, 2016 at 16:00 CET for our first webinar of the series following our May 2016 workshop on Countering Homegrown Violent Extremism in the Nuclear Sector. Mr. Jim Snyder will identify lessons learned from the In Amenas terrorist attack and how the associated security recommendations could be applied to the nuclear industry. Which liabilities arise where security is breached and damage is incurred by individuals, property and/or the environment? How will the responsibility for compensation claims for damages or cost recovery efforts be addressed? How would persons or organisations be held accountable when it has been determined that their failure to meet their assigned duties or responsibilities resulted in, or contributed to, significant damage? Would meeting basic assigned duties (i.e. license requirements) be sufficient to prevent being pursued for third party damages? Answers to these questions and a full understanding of the respective legal and financial liabilities associated with a significant incident is essential for senior managers to make informed decisions regarding the purchase and use of sealed radioactive sources as well as to implement appropriate measures for the management of their sources throughout the life-cycle. Unfortunately, in many instances, managers and other individuals accountable for the security of sources are not aware of the possible consequences an incident involving their sources would have for their organisation or for themselves. This professionally facilitated and interactive webinar will feature presentations and a panel discussion between Mr. John Miller, International Isotopes, USA and Ms. Kathryn Rauhut, the Stimson Center, USA. You will be asked to provide your opinion on various topics, including your level of awareness to the topic and areas where further work is needed. Finally, you will have the opportunity to ask questions to the invited speakers. Join us on December 2 at 16:00 CET for our first operational webinar on the Security of Radioactive Sources . We will be hosting presentations and panel discussion on the experiences and lessons learned from developing regulatory requirements and implementing security upgrades for radioactive sources. The webinar will include discussions and feedback on main challenges and solutions when strengthening the security of sources. It will provide both a regulator and an operator perspective, and will cover diverse areas such as identification of stakeholders, roles and responsibilities, need for adequate skills and competencies, and the impact of new security provisions on the use of radioactive sources. Through a survey, participants will be asked to provide their opinion on various topics, including who should be in charge of the security of sources, safety or security – which comes first, or the adequacy of international recommendations. Finally, participants will have the opportunity to ask questions to the invited speakers. • How these efforts support state and industry commitments to improve nuclear security implementation in the lead up to the 2016 Nuclear Security Summit. During this 60-minute interactive webinar participants will be able to ask questions to the speakers, participate in polls and download information material. Target audience: individuals, non-training organisations, and training and academic organisations interested in partnering with the WINS Academy. The WINS Academy provides personnel with management accountabilities for nuclear security with opportunities to become professionally certified. By offering the first online certification programme in the world for nuclear security management, we aim to catalyse professional development, knowledge exchange and leadership innovation in nuclear security management. Ultimately, the programme will lead to growing levels of competence in a way that is demonstrable and sustainable, thereby improving worldwide leadership and effectiveness in the implementation and regulation of nuclear security. During this interactive webinar participants will be able to ask questions to the speakers, participate in polls and download information material. Register today to learn about how to acquire the training, certification and professional recognition to demonstrate your nuclear security leadership and expertise. We believe that the security of nuclear and radiological materials increases when professionals with accountabilities for security can learn, discuss and share Best Practices with each other. As the only membership organisation in the world dedicated to Nuclear Security Leadership, WINS provides a library of best practices created by industry insiders. We provide training and qualifications for people who have responsibilities for the management of nuclear security, and organise workshops, seminars and evaluations that bring together nuclear security personnel to work towards a common goal of Nuclear Security Excellence.